The island of Cres is located in the Kvarner Bay and is separated from the island of Losinj by an artificial canal built by the Romans. The southern part of Cres is covered with rocks while the other half has a lot of pine and oak tree forests. Cres Island will surely amaze you with its calm and originality. Hidden cover, beautiful beaches and the untouched nature are just some of the reasons that will make you fall in love with Cres. 1. Hotel Kimen*** - located close to a gorgeous beach and only 10 minutes of walking to old town, hotel Kimen is an ideal place to stay in when visiting Cres. It is an eco friendly hotel with a Green Key certificate, something that we and the guests really love. Close to the hotel you will find several tennis courts as well as a beautiful cove to swim in. 2. Depadance Kimen*** - neighbouring building of Hotel Kimen is located only 70m from it. All hotel amenities are available to those who are staying in the depadance building. Town Cres is only 1,2km away which is a great opportunity for a lovely stroll to there and back. 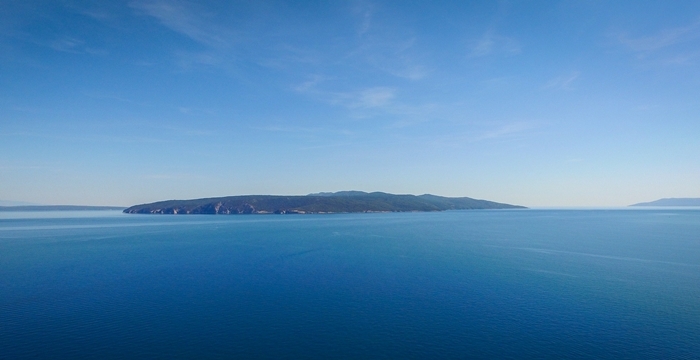 Cres Island is the one of the largest islands of the Adriatic. It is connected by ferry from Istria (line Brestova - Porozina) and the island Krk (ferry Valbiska - Merag). Famous natural phenomenon on the island is the freshwater lake Vrana. Cres Island is the habitat of protected species of griffon vultures, which are unfortunately an endangered species. On the island we recommend a visit to the city museum Osor, a small town near the bridge that connects the islands of Cres and Losinj. One of the most beautiful beaches on the island of Cres is the beach at Sveti Ivan (Saint John) near Lubenice. Lubenice is one of the first inhabited places of the island. Built on the cliff 387m above the sea. Another place not to be missed is Valun: a small town surrounded by sandy beaches and coves. But the most important and most known town on the island with a large marina is town Cres. In each of the mentioned town and villages you will find private apartments to rent. As there are not many make sure you do your booking in time! Towns on the island are mostly surrounded by the old city walls. The island Cres has been inhabited since ancient times, as attested by finds from the ruins of the ancient castle in the town of Cres. There are many old houses on the hill in the city center. In the cultural center of the city of Cres the church Sv. Martin with a Franciscan monastery from the 16th century and a castle of the Sforza family from the 17th century are a must see. Do not miss the feast of St. Mary of the Snow on 5th August in the town Cres, Osor musical evenings and Eco-center Caput Insulae in Beli, where you can admire the beaufitul griffon vulture. We offer total 51 facilities.